Not that he had really expected his father to rush back from his impromptu hunting trip once he got the news of Lakwi’s illness. Despite a couple of anxious nights, Rokkan’s little sister was recovering well under Anna’s ministrations. Gripping the brush, he pulled it in long strokes through Eclipse’s coat. The horse’s flank quivered as the burs amassed on the morning ride snagged the bristles. His dogs, Tracer, Rivet and Grip, lying under the railings, thumped their tails in a slow rhythm. Two blasts meant a Markan, but which one? Ah well, never mind. Bitjanan could deal with it. This was the first moment he had had to relax since little Lakwi fell ill.
Rokkan grimaced. So Papa must have decided to make Haka Markan of the West while he was away in Silisea. At seventeen, his cousin was only a couple of years older than Rokkan but Haka was third in line to the throne, after Naetok, and he made sure everyone knew it. Pity the new arrival hadn’t been Lord Challak for his best friend Lukarn would’ve been sure to accompany his uncle. Hakka swung from his charger and flung his reins at Rokkan. Rokkan caught the reins in one hand and arched his dark eyebrows. Beside him, Rivet and Chaser muttered a growl. 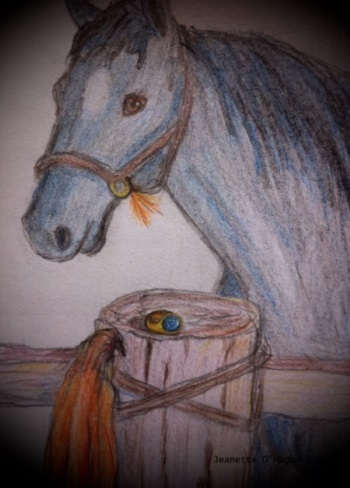 ‘Well, fellow, don’t keep me waiting.’ Haka slapped his thigh as his sliver eyes swept around the horse yards. ‘As you wish cousin.’ Rokkan gave an extravagant bow. Hakka’s head snapped back, a sudden flash of shock on his sardonic face. ‘Rokkan, I did not…’ He took a deep breath and began to slide to his knees. ‘Forgive me, your Highness.’ Haka’s companions quickly dismounted and knelt on gravel behind him. At that moment, a couple of grooms rushed up to take care of the horses. As Rokkan polished Eclipse’s glowing blue-grey coat with straw, Haka stood nearby fidgeting and trying to hide his sour looks. Rokkan patted the stallion’s rump and beckoned to a hovering groom. Grabbing his cloak from the railings, he narrowed his eyes and frowned. Where was it? Haka flinched and rubbed his arm. ‘Hopeless,’ he muttered under his breath, then his pale face flushed when his gaze met the prince’s. As they strode through the gate from the service areas of the palace into the front courtyard, a guard in the gate tower lifted a long horn to his lips and sounded four long blasts. The gates began to glide open. Rokkan stopped midstride and closed his eyes. This time, it had to be Father. The Kapok rode through the gate at the head of a cavalcade of warriors in full regalia and with young Naetok on a pony beside him. Behind them came the litters carrying the Kupanna and her attendants and pack horses and yarmas. Rokkan sunk to his knees, as did Haka and his companions behind him. His father almost rode past them before he brought his sturdy mountain horse to a halt. His face was a mass of pained creases. Rokkan touched his forehead to the gravel, ‘Yes your Majesty.’ His stomach tensed. What punishment had he attracted now? He strode towards the front entrance of the palace just as the great doors swung open and Bitjanan came hurrying out to greet his royal master. Rokkan sprinted after him. Papa was unpredictable and exacting, but for all that, it was good to back home in the mountains of Tamra. And The Herbalist’s Daughter (in Tied in Pink romance anthology).